42 Quilts Quilt Of The Week - Everything Old Is New Again! 2005, KC Star Quilts, out of print. "Strange and exotic things grew in Grandma's garden - at least to my way of thinking. Among these was okra, which was the strangest looking edible plan I'd ever seen. I couldn't believe someone actually thought that okra would be something good to eat! Another plant that fascinated me was eggplant - not for its unusual name, but because of its color. I remember thinking that deep purple was the most beautiful color I had ever seen. It still ranks among my favorites." 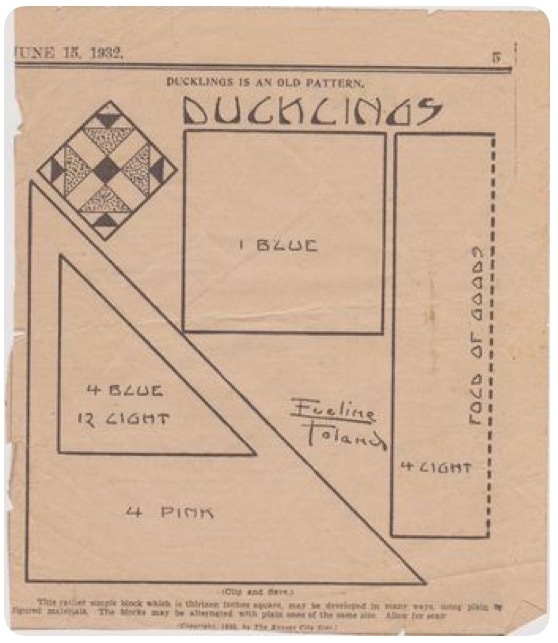 The block: Ducklings is from June 1932. 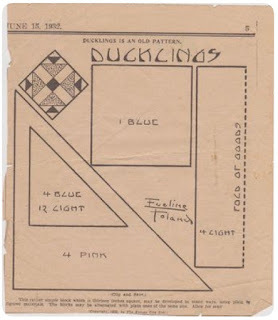 Can you imagine having a quilt pattern published once a week in the paper!? Remember this is long before an abundance of quilting magazines we have now and, of course, Pinterest. I can't even imagine how exciting it must have been to get that paper every week to see what the pattern would be! Construction: Although now it's common to see blocks of various sizes in quilts, in 2005 playing with scale was new to me. The blocks are 3", 6" and 9" set on point. 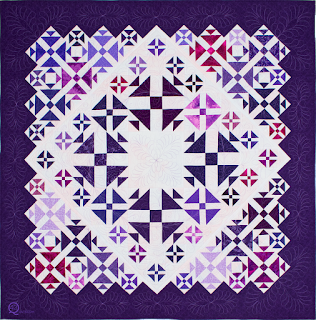 I love the busy, busy visual of all these blocks set like this and I like the center left open for beautiful quilting! The balance is very pleasing to me still to this day! Provenance: Eggplant and Okra has the dubious honor of being the first and only quilt I've ever had juried into the AQS quilt show in Paducah. That was in 2006, before they started their regional shows. Of course I didn't win anything, but I was naive enough to think I had a shot at a prize! (The quilts that win are off the wall amazing!) I rarely enter shows anymore, so this still is - and will remain - the crowning feather in my cap for a long time to come!